I keep trying to convince MyLove that shopping at Goodwill for Home Decor items is worth my time. I always find unique items for bargain basement prices. Here is a recent find that a woman found at her Goodwill for a mere $12.34. There have been other art and paintings found at numerous Goodwill stores values topping at $165,000! Not bad for a quick investment. MILWAUKEE (AP) — “Red Nose” just meant a reindeer named Rudolph to Karen Mallet until she bought a print by that name for $12.34 at a Goodwill store in Milwaukee. It turned out to be a lithograph by American artist Alexander Calder worth $9,000. Mallet’s good fortune is at least the fourth time in six months that valuable art has turned up at Goodwill, where bargain-hunters search for hidden treasure among the coffee cups, jewelry, lamps and other household cast-offs. Last month, a Salvador Dali sketch found at a Goodwill shop in Tacoma, Wash., sold for $21,000. Last summer, a North Carolina woman pocketed more than $27,000 for a painting she bought for $9.99 at Goodwill. And last spring, a dusty jug donated in Buffalo, N.Y., was discovered to be a thousands-of-years-old American Indian artifact — it was returned to its tribe instead of being offered for sale. When told of the Milwaukee woman’s find, a Goodwill spokeswoman said workers at its 2,700 stores try to spot valuables and auction them on the organization’s online auction site to net more money for the charitable group. But things slip through the cracks and the workers aren’t art experts. Mallet, a media relations specialist for Georgetown University and others, didn’t even like “Red Nose” when she first spotted it during one of her frequent Goodwill shopping trips in May. “The big find that day was this great set of steel knives, in a block, for $18.99” by Wolfgang Puck, she said. But the graphic black-and-white picture was striking. In low-browed terms, it might be described as an abstract image of an ape with a hangover, with spiral swirls for eyes like the ones in cartoons when someone gets punched. A large red nose is the only color. Then she saw the Calder signature. “I thought, I don’t know if it’s real or not but it’s $12.99. I’ve wasted more on worse things,” she said. A discount for using her Goodwill loyalty card brought the price down to $12.34. 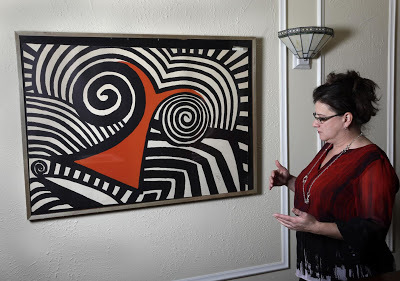 Once home, she searched the Internet and found similar lithographs by Calder, who died in 1976 and is widely known for his mobiles and abstract sculptures at airports, office towers and other public places. Mallet’s piece was No. 55 of 75 lithographs and was made in 1969. 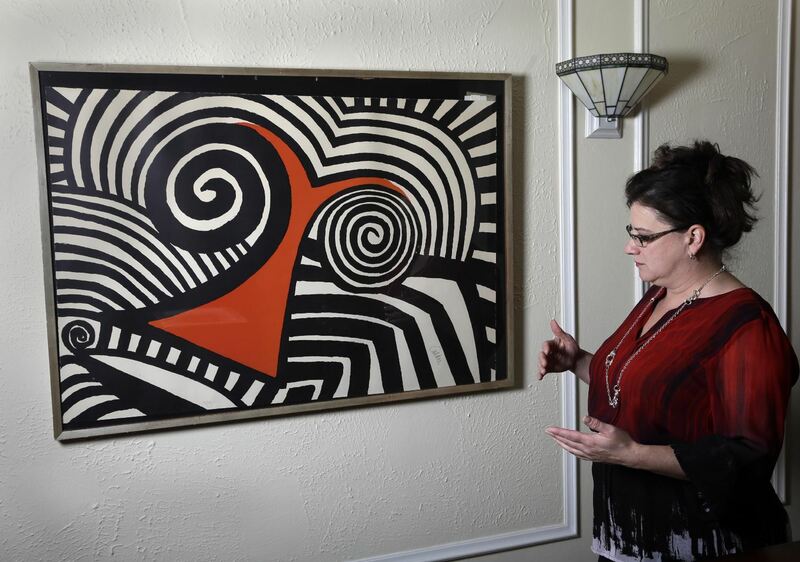 Jacob Fine Art Inc., in suburban Chicago, recently set its replacement value at $9,000. — In 2009, a painting by Utah artist Maynard Dixon donated in Santa Rosa, Calif., sold for $70,001. — In 2008, a Baltimore-area Goodwill store netted $40,600 from a Parisian street scene painted by Impressionist Edouard-Leon Cortes. — In 2006, a Frank Weston Benson oil painting donated anonymously in Portland, Ore., brought in $165,002 — Goodwill’s top haul so far. Wow! Do you think she will keep it? Have you found anything of value at your local Goodwill Store or resale shop? Nope, me neither! but for some reason I keep going back! Hope you enjoy the silly reading material! Okay, sidenote here but don’t you notice how all of these stories are of MEN throwing away good stuff by mistake? Just sayin’ guys, BE CAREFUL! I’d better keep my mouth shut since I accidently left my purse in a Burger King and didn’t realize it until I was an hour down the road! No kidding – and someone turned it in with all contents saved-ID, money, credit cards. P.S. Finding stuff on the curb is FREE! That is CRAZY — like Cra—yyyy—zzzeeee! Dang how cool is that! Unbelievable! We've found some great things; but nothing of that magnitude! I'll have to pay closer attention to things now! There BETTER be a Goodwill in Heaven for me to decorate my mansion!!! Been shopping for goodies there for over 15 years – and I'm 30! wow some people have all the luck, we just had a Goodwill store move into our town but it only has clothes, we do have a Salvation Army store, and have bought nice frames for my quilling ! !